The living room is the beating heart of the family home, and the time we spend enjoying movies, shows, and games with our loved ones in this special space gives us some of the most precious memories we'll ever have. It's important that this room looks and feels exactly how we dream it should, and with a unique combination of traditional style and modern design, our Bridgeport TV stand offers an incredibly versatile focal point for this essential room. With an impressive size and a timeless look, it'll blend in or stand out with ease, evolving with your home as it develops and grows. 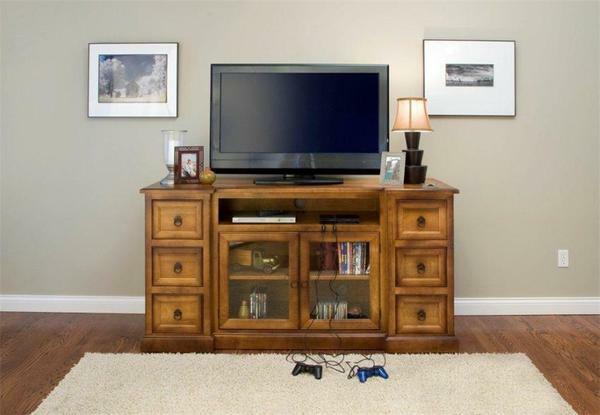 Built with solid wood and a level of heirloom craftsmanship that promises years and years of beauty and strength, this unique TV stand is as big and beautiful as it is clever and durable. The six media drawers provide custom space for an ever-expanding library of films, box sets, and games, while the smoked glass doors in the center provide remote access to consoles and media players while keeping them protected from dust, pets, and wandering little fingers. Finally, the open top space rounds off this modern traditionalist design with a convenient space for keeping DVD players and games consoles in easy-open reach. Taken as a whole, this design blends in a huge amount of storage space with the warm, comforting feel of the living room, and does so with elegance. Every single piece of the Bridgeport is built by hand right here in the USA, promising you nothing but the best in home-grown quality and care. Every surface is solid wood - no veneers, plasterboard, or cut corners - and this stand is available in your choice of native hardwood and stain. If you've any questions, please don't hesitate to call or send a message - we would love to hear from you.